With a tough game against Coventry last weekend and a TV fixture on Sunday against London Scottish the season feels like it is in full flow now. Matt Merritt from @RugbyLI has been speaking with Pat Cilliers to find out how the players are feeling after the game with Cov, how it feels to have an away fixture so close to home and the story behind Fines Master Gin! Hey Pat, how is you’re day going? We’ve got an off day, but I’ve got a few things on the go. The team have been giving us extra things to do, meal prep stuff… Those little 1% gains, if you want to call it that Then I’ve got to head into town to deal with life after rugby! So looking back to last weekend, a win over Coventry in a tight game, how did you find it? I suppose the whole experience was pretty cool actually! I didn’t know anything about the ground or the crowd, but there were close to 3,000 people with quite a few Irish supporters amongst them so the scene was set for quite a tight game and we knew it was going to be tight but I didn’t think it was going to be as tight as it ended up. Fair play to Coventry though, they played really well, scrummed really well and scored some nice tries. They put us under pressure and I think there was a sigh of relief that we got the win because it could very easily have been a loss. We’ve actually treated it like a loss, we’ve probably learnt a lot more from the win against Coventry compared to the other wins early in the season. Does it keep you sharp having tight games as well, I assume easy wins can lead to the team getting complacent? Definitely! It’s a credit to the rugby in England, the Champ is extremely tough – as I’m finding out – and English rugby is in a really good place. You’ve alluded to it there, this is your first time in the Championship. Were there any fixtures or clubs that stood out for you when you looked at the opposition you’d face this season? As I said I don’t really know the league that well. When we’re doing the reviews, I have to ask which team is which sometimes but there are a few games that stand out. Ealing away was a really nice win for us because we knew a lot was riding on that and the boys were feeling the pressure for that game… Every game has its own challenge but obviously there are a few games that are probably going to be critical in the season but as we found out last weekend every game has its own difficulties! I think you’ve been involved in every game so far, but it is clear there is a lot of competition in the front row this year. What’s it like knowing there are guys waiting in the wings to compete for those spots? It’s a testament to where the club is at. At Championship level (and even in the Premiership) the scrum and set piece has to be dominant. We’re fortunate at Irish we have a huge amount of depth and talent, young and old, some international players too. When we’re doing our different aspects of training set piece is probably the toughest one and we like to keep it that way. We get stuck into each other! Whoever is fortunate enough to wear the jersey on game day is lucky, but we also know that the guys waiting their turn are just as good. So yeah, we’re very fortunate at Irish to have so much competition! 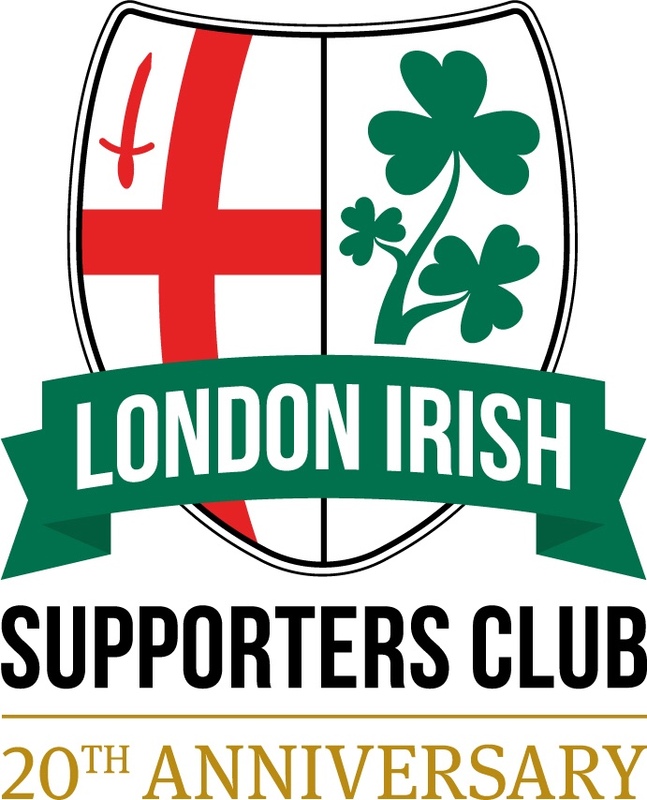 This weekend it’s a very local derby against London Scottish. Are you looking forward to an away trip where you don’t have to travel too far away? I’m expecting a huge Irish contingent there! Again, I’m just enjoying my rugby and loving my environment. The boys are really up for this weekend. It’s televised which is a big occasion! So how did you get the idea of making your own gin? As rugby players you always have an ear to the ground for life after rugby, you’d be silly not to. It’s a credit to where the RPA and England are that they’re promoting to players the need to be proactive about life after rugby, it really does sneak up on you! From a young age myself and my business partner – my best mate Mike Rhodes at Sarries – we’ve always been brainstorming ideas. It came from an injury while I was at Leicester Tigers. I had quite a bit of time on my hands and I was doing some work experience. I went to a gin distillery on a farm and it was just a perfect scene, you know! There were some sheep running around, some cattle in the back and then this huge still. I just thought I could see myself doing this. I called Mike up the next day and said “I’m gonna make a gin, are you interested?” and he said let’s do it! That was probably 16 months ago and we received our first batch probably 3 or 4 weeks ago. Things are looking pretty good, it’s very exciting! You mentioned you’ve known Mike since childhood, have you always planned to go into business together? I don’t think it’s always been set in stone. We’ve played a lot of rugby together. We were at high school together then played for the Sharks, Lions and the Stormers but at a young age, sort of 19-20, we had a friend who was a potato farmer and you can make alcohol from potatoes so at that age we were thinking of making a vodka and a lot of ideas later, a lot of back and forth and we’re onto our first project! Well it’s certainly a nice change from the coffees that so many other rugby players are bringing out…! I suppose both are very social and rugby players are very social in general so it’s not far from what we do and like! We’re getting a lot of interest from people when the coffee hours are over the gin takes over! Naming a product is always really hard, but Fines Master is a really good name with a good rugby theme, who came up with it? You say it’s a rugby name but we were going for sports in general, whether its football, cricket, hockey… whatever. There’s always a fines meeting at every club and people understand that. We wanted a sport name but nothing too overboard. I suppose it’s one that just popped up. We had a few names on a shortlist and we just loved it. We got a good branding team who helped us with designing a logo and stuff. We’re pretty happy with where it’s at! The packaging is very distinctive too, with the bold colours and striped wrapping paper. Were the colours something particular to the two of you? Well the whole wrap and the design of the paper is to represent a jersey from any sport. We wanted to capture that experience, to give people a taste of what sportsmen put themselves out there for. You battle for 80 or 90 minutes and afterwards you take off your shirt and have a drink together. That’s the experience we wanted to create. It’s been received really well, people are really enjoying the packaging. As far as the colours, we wanted something striking, something that catches the eye. The gin market is quite competitive so this really does stand out, people are asking “what’s that Fines Master about”. We live in an Instagram age where people like to take photos and selfies, I’m not the biggest selfie taker but I think it photographs really nicely and it’s being perceived really well. We’ve seen Fines Master is available at Hazelwood now and it’s proving popular with Saracens fans too. When will we see some at the Madejski? Very shortly! I’m ironing out a home fixture, probably a cup fixture in November. There’s some interesting talk about either a trailer or container for the Supporters Village too. So there are some really exciting ideas to bring the fans closer to the players and closer to Fines Master too! Our thanks to Pat for giving up his time. Keep your eyes peeled for Fines Master in the Supporters Village soon and keep checking back on lisc.uk as we might just have some exciting news in the near future! Find out more about Fines Master at http://www.finesmaster.co.uk and check out our Competition for a Signed Bottle!